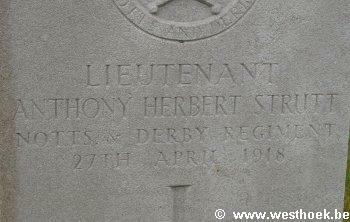 ANTHONY HERBERT STRUTT Lieutenant 16th Bn., Sherwood Foresters (Notts and Derby Regt.) who died on Saturday 27 April 1918. Age 22. 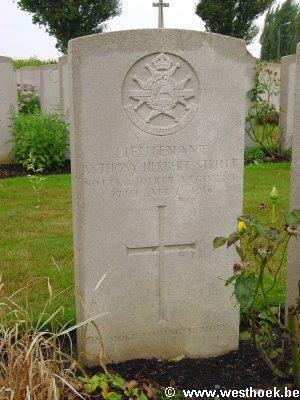 Lieutenant ANTHONY HERBERT STRUTT 16th Bn., Sherwood Foresters (Notts and Derby Regt.) who died on Saturday 27 April 1918. Age 22. Son of George Herbert and Edith Strutt, of Blakeney House, nr. Derby. BRANDHOEK NEW MILITARY CEMETERY No.3 Grave : IV. A. 5.